The Stupid American | A Daily Dose of Zen Sarcasm! 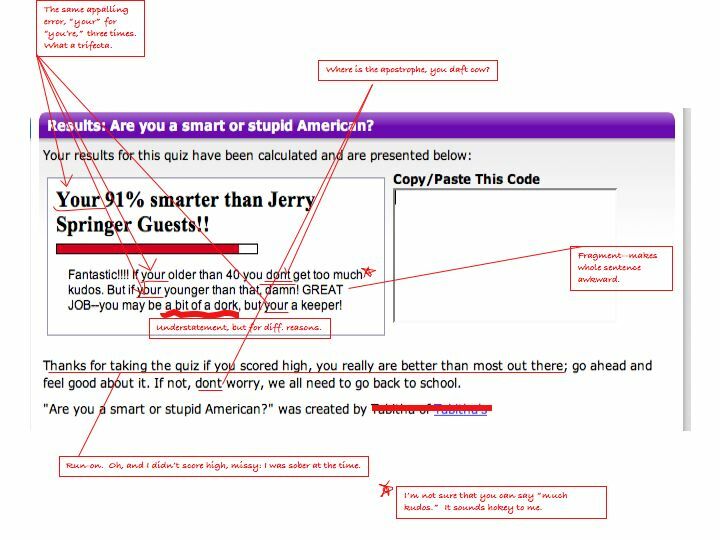 This morning, after morning momly duties and such, I was poking around the Inty-net and I found a quiz called "Are You a Smart or Stupid American?" Naturally, I took it. I got a 91% and I felt pretty good. But then I got my results screen and I. Was. Appalled. Here was a quiz purporting to judge me on whether I was smart or stupid… only that the author revealed itself to be really shockingly ill-prepared to be a judge of anything. So, absolute dork that I am, I am sharing with you some… er… "tips" to help the (semi) anonymous quiz maker on its way. If you want to preach on about stupid versus smart Americans, preach on sister. But please get a friend to proofread your quizzes next time. Jebus. PS: I assume some of you want to take the quiz. 09 Jan	This entry was published on January 9, 2007 at 8:39 am and is filed under Schoolmarmish. Bookmark the permalink. Follow any comments here with the RSS feed for this post. I love my fellow grammar nerds!